New book, some shelf wear to jacket. 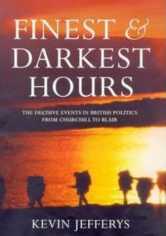 This book ranges from Winston Churchill's accession to the premiership in 1940 through to the emergence of New Labour in 1994 - via the Suez fiasco, the Profumo affair, the three-day week, the winter of discontent, the Falkland war and Black Wednesday - to identify precisely how significant these famous episodes really were. It combines vivid portraits of the dramatis personae with sharp, often controversial, analysis of the unfolding crisis.